This compact 4 in. diamond hone sharpener is an ideal size for keeping in your tackle box, tool kit, glove box, or outdoors bag. The sharpening surface has an interrupted section for blade edges, a straight groove for hooks, and a solid section for honing points. A cover is included which doubles as a base for the sharpener. Interrupted surface speeds up the sharpening process. Cover doubles as an extension of the base. Straight-line sharpening groove for hooks and other pointed objects. 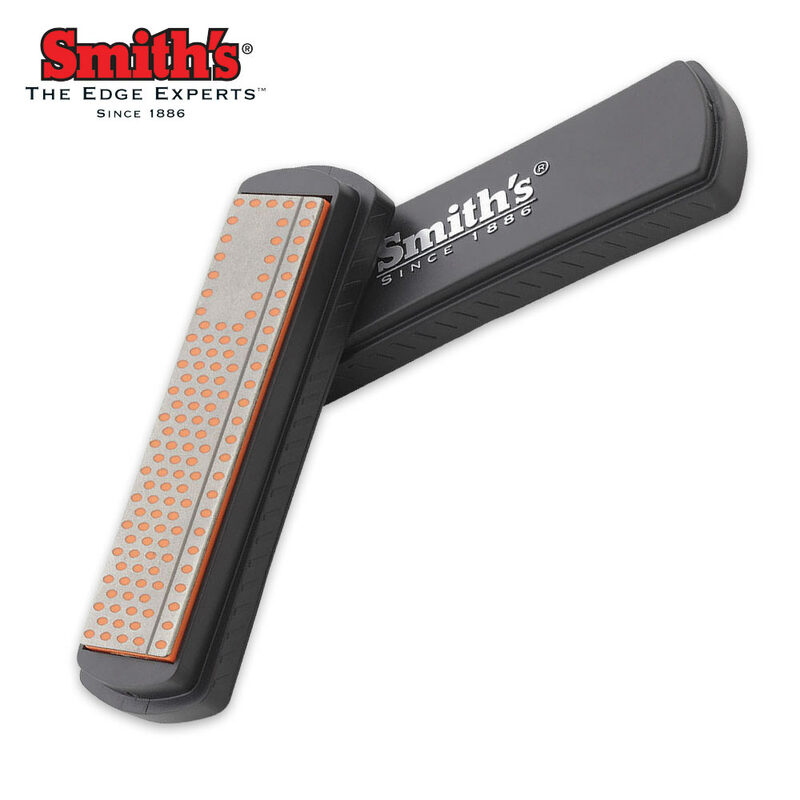 Solid "Sharpening Pad" for the tips of your knife blades or small cutting tools. This little sharpener packs easily and goes along with me when I plan on spending more than one night in the woods. It's a little coarser than I like for most of my knives, but it is perfect for resharpening my machetes when away from home. It works equally well on my axes. The lid snaps on firmly and when you remove it, it may be snapped equally firmly onto the bottom. This makes it easier to hold onto and safer to use, as it gets the abrasive surface and the blade of the knife a little farther out from your hand. This sharpener has a grit of 750. I would like to see one exactly like it in 1500 to 2000 grit.